Manchester has been awarded a four-year contract to host football business Soccerex's Global Convention, which it is estimated will inject around £23m into the city. 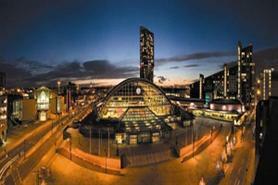 More than 4,000 delegates are expected to attend the event annually at Manchester Central from 2014 through to 2017. Andrew Stokes, Marketing Manchester's chief executive, said: "The new four-year relationship announced during this week's European Forum is a major coup for the city and will generate £23m for the local economy during the life of the contract. "The Global Convention commands significant international media attention and will further strengthen Manchester's position as the spiritual home of football in the UK." Soccerex chief executive Duncan Revie said that factors including transport links, quality of service and football heritage contributed to Manchester's selection. He added: "There was interest from many other cities but the potential here in Manchester was too big to ignore. We have extremely exciting plans to ensure that we will bring the world of football together in Manchester from 2014-2017."